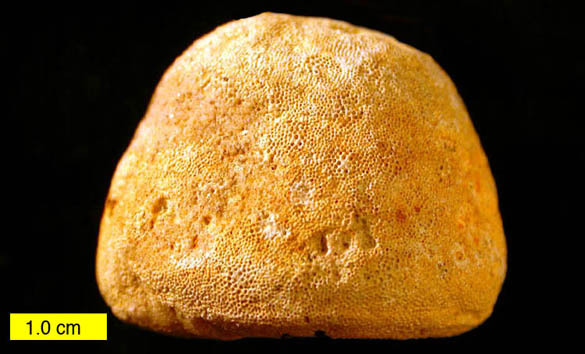 This simple, rounded fossil with tiny holes on its surface is the trepostome bryozoan Prasopora falesi (James, 1884) from the Middle Ordovician Galena Group of eastern Iowa. It was collected with dozens of others on an Independent Study field trip in 2003 with Aaron House (2004). Aaron was studying the paleoecology of these bryozoans; he was especially interested in borings in these calcitic bryozoans called Trypanites. Part of Aaron’s project involved cutting through these Prasopora colonies to see the borings on the inside. He made acetate peels of polished slabs of the bryozoans, a technique that produces a detailed acetate replica of internal details. The image above is of one of those acetate peels. You can see the tubular zooecia that contained the original zooids (or individuals) of the bryozoan colony. (They are a series of ellipses because of the angle of the cut and variations in zooecial growth directions.) The black dots are very curious: they are apparently brown bodies, the fossilized remains of the tiny polypides inside the zooecia. These organic remains were replaced by dark minerals and preserved all these 470 million years since. Anstey, R.L. and Perry, T.G. 1972. Eden Shale bryozoans: a numerical study (Ordovician, Ohio Valley). Michigan State University Publications of the Museum, Paleontological Series, Vol. 1, 80 p.
James, U.P. 1884. Descriptions of four new species of fossils from the Cincinnati Group. The Journal of the Cincinnati Society of Natural History 7: 137-140. Morrison, S.J. and Anstey, R.L. 1979. Ultrastructure and composition of brown bodies in some Ordovician trepostome bryozoans. Journal of Paleontology 53: 943-949. Nicholson, H.A. and Etheridge, R., Jr. 1877. On Prasopora Grayae, a new genus and species of Silurian corals. Annals and Magazine of Natural History 4:388–392.